Dog sitting with a host family: how does it work? Big or small, each dog has its own personality. When going on holiday, it is not always easy to find a resort that accepts pets. If you choose dog sitting in a host family it is very important to understand how this option works. How does dog sitting in a family work? By leaving your pet with a host family, in a way like kennels but with the warmth of a friendly family home. Your pet’s new temporary dog sitting family will treat him as if he was their own. By being a dog sitter, your pet’s adoptive family will show their enthusiasm and all the dedication and care your dog will need. Depending on which carer you choose, your pup may be on his own or with other animals. The dog sitter may have their own pet or even keep other dogs during the stay. If this is the case, some owners see this option as a great opportunity for their pet to make new friends! How long may I leave my dog? It is not as common, but some dog owners need a yearly care, for example, on work days or every day depending on the situation. Whatever your reason, whenever the time, the dog sitting option can be adapted to all situations when you choose the right family with a schedule that suits you. Will my dog settle in with the family? For most owners, it is difficult to say whether your dog will settle in quickly or not. To find out, the best way is to take him on trial, only for a few hours at first in his new family. You’ll soon see how your pet reacts, whether his tail is wagging, whether he seems happy when you leave. If this first visit is a success and your furry friend is happy, no need to worry, go ahead! This is the right sort of care for you and your dog! After the first few visits if you have the slightest doubt and your pet is not happy, don’t insist, this not the right option for your pup. Why should I choose a family care? Generally speaking, this option is very popular for dog owners. Unlike cats, which are more independent, our canine friends need more attention including the need to feel human presence. 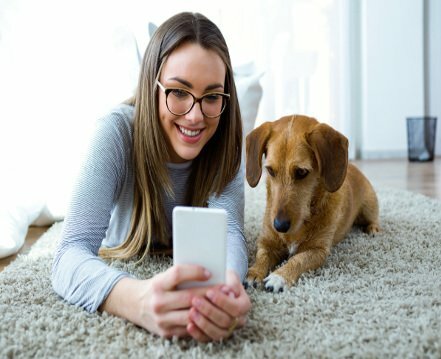 That is why many dog owners like the dog sitter to have their own pet, so that they can keep each other company and so your dog doesn’t feel lonely. Dogs can feel anxiety and can get stressed if they don’t feel safe and reassured. Generally speaking this is when barking and howling becomes an issue. To avoid unnecessary stress, most dog owners choose a home where they know there will be a human presence and a warm, loving atmosphere. The friendlier the dog sitter seems, the better the owner will feel when saying goodbye!